I got my shield out of dust since a crash some weeks ago. Previously was in router mode but want to go to bridge. So i did my cabling as advised for Bridge mode and the Webgui is showing behind 10.10.10.111 without a problem and traffic go thru as expected. I did a factory rest and a fwupdate (via the WebGUI) and everything seems okay. Now i want to connect via ssh as i was doing usually (I want to apply Hans hot fix) so went to -> system -> Administration and followed page 12 of the administration pdf. To add a Traffic rules to permet LAN access to 10.10.10.111:22 without success. Do you have the LAN interface picked? 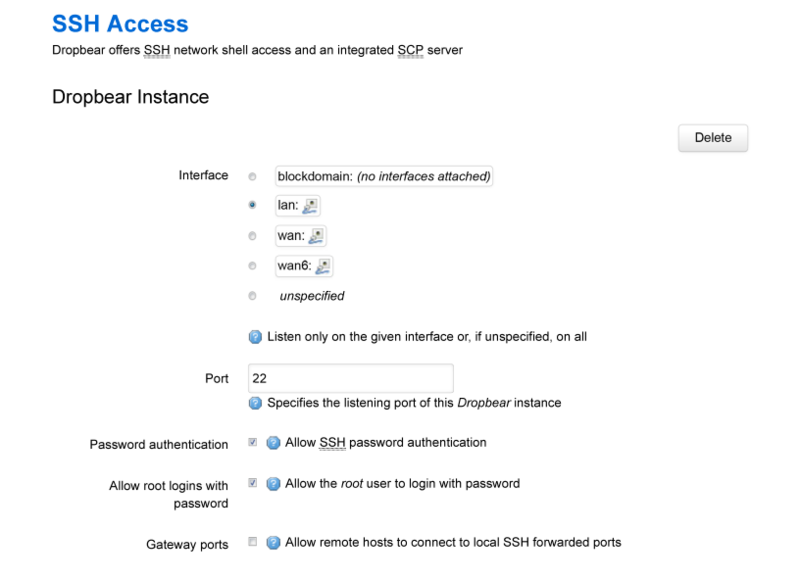 Both "Allow SSH password authentication" and "Allow the root user to login with password" checked then "save & apply"? Using SCP for your file protocol? Have you tried deleting the dropbear instance, then recreating it as below? You may also try changing the port to something else, just in case something is already using port 22. Change to 221 or so, then set up WinSCP to use 221. To unsubscribe from Itus Networks Owners Forum, click here. Got it working after another factory reset. It worked first time i set it up. No idea of what I did wrong.